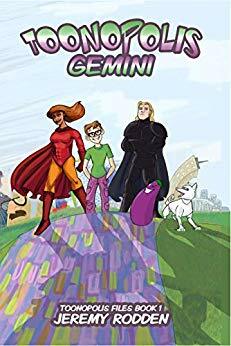 In this rollicking, nationally bestselling middle-grade adventure, Michael Fry’s witty text and hysterical artwork combines superhero action with classic fish-out-of-water humor. 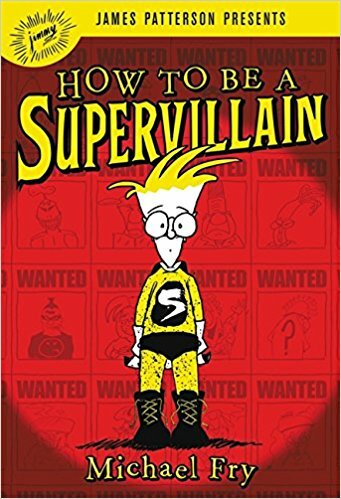 This book is along the lines of other modern illustrated chapter books (eg, Diary of a Wimpy Kid) with what are essentially comic panels inserted into written text. Instead of simply being illustrations, the panels themselves continue the narrative. It’s a good elementary school/middle school bridge book, with enough fun pictures to break up large chunks of text but without relying solely on the images to keep attention. The book is full of random-based humor. Sometimes it hits (such as the randomness of The Smear’s stains and stain-based fighting attacks) and sometimes it misses (some of the lame superheroes/villains). Unfortunately, I also find it falls into the trap of “old person writing down to young people” using such tropes as parents always being annoying/idiotic and I often felt that Victor was portrayed as *way* younger than the 12 years old he is supposed to be. However, it was definitely fun. The concept that superhero/supervillain battles were ostensibly public displays and scripted performances like professional wrestling is a fun one. The plot and story that spun from this central idea made for some fun moments, especially as Victor grows to understand the complexity of The Smear (who is really the only character that isn’t a basic stereotype throughout the book). I hope as the series continues the author, who is more well-known for being a comic artist, is able to talk to his audience instead of continue to rely on what I call “Disney TV show” tropes and gags. His art style is perfect for this hybrid comic/chapter book format and his core ideas are fantastically fun. Even though Victor is supposedly twelve, he really presents as way younger throughout the book. Thanks to this, he never really acts in a way inappropriate to ages as young as 8. There is no real danger or violence throughout the book and definitely no language or sexual concerns. There’s no reason any young reader would have a problem with content here.